Although I do not often cook with them, I still pretty much always have some dried pinto beans on hand and now that the weather has turned cold and soup and stew season is full upon us I decided it was time to cook some up in a nice hearty winter dish. 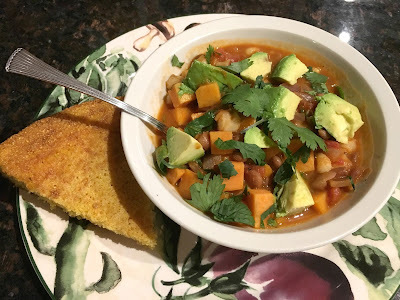 I had my eye on a recipe for a sweet potato and pinto bean soup that intrigued me because it called for basil, an herb with which I do not usually associate sweet potatoes and pinto beans. So I decided to make it. Imagine my surprise when I could not find any decent basil at any of my usual grocery stores here in Chicago in the dead of winter. This led me to reconsider, and I decided maybe I would make that dish in the summer when there is plenty of fresh, beautiful basil on hand. 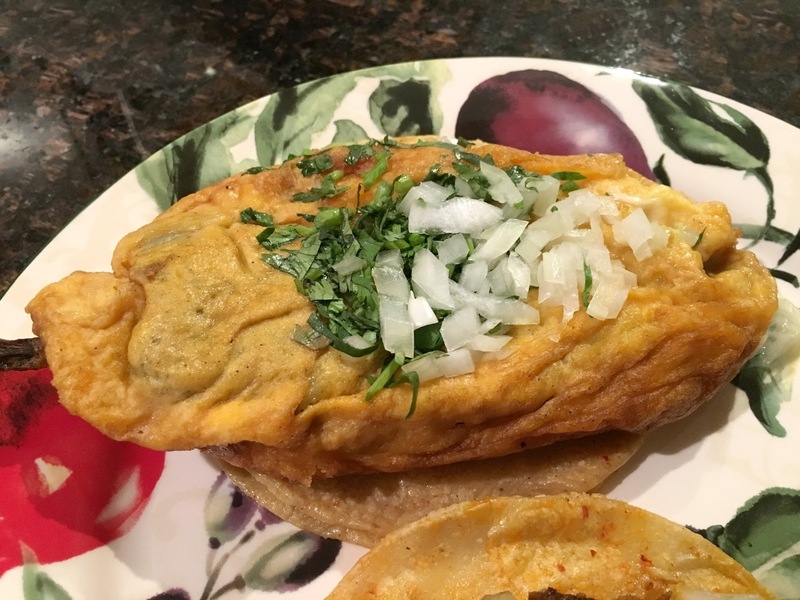 I then turned to another recipe I have been eying for a while that uses pinto beans. The recipe actually calls for butternut squash, but I had already bought the sweet potato so I decided to go with that. And it worked out beautifully. I used my home-made chili powder which has no heat so I added half a teaspoon of cayenne which added the perfect amount of heat for me. I used chicken broth since I had some in the freezer but I would normally use vegetable broth since I always have that on hand. 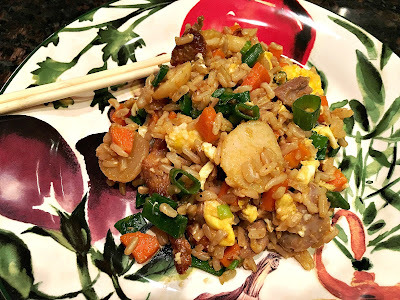 The relatively short cooking time leaves the flavors of each ingredient intact while at the same time bringing them all together for a bright, fresh flavor. A batch of Skillet Cornbread provides the perfect accompaniment. Add a green salad and you have a perfect meal. Heat the oil in a large saucepan over medium-high heat. Add the onion and garlic and cook, stirring often, until they begin to brown, about 5 minutes. Add the chili powder and cook, stirring, for about 30 seconds. Add the sweet potato, broth, hominy, beans and tomatoes. Bring to a boil then lower to a simmer. Cover and cook, stirring occasionally, umtil the sweet potato is tender, 25 to 30 minutes. Lamb and cinnamon is one of my favorite flavor combinations. 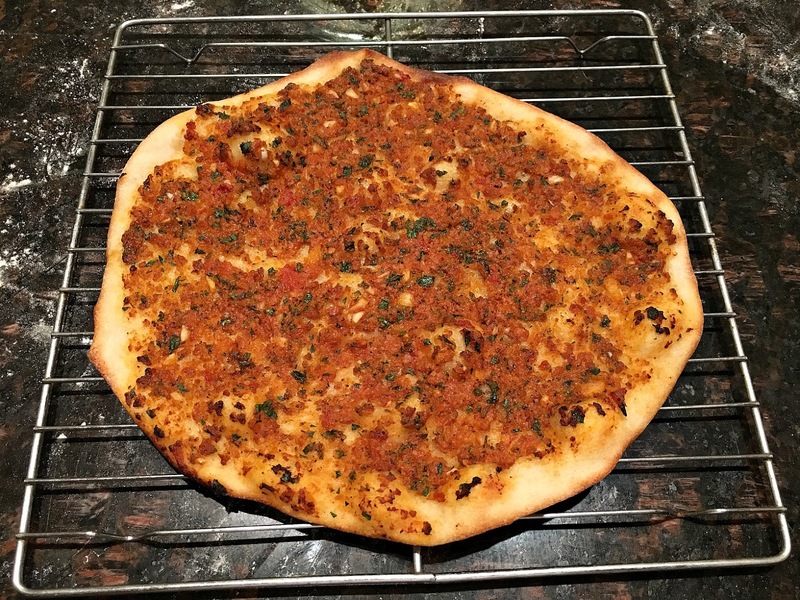 So when I came across a recipe for a flat bread with lamb and tomatoes with cinnamon (Lahmacun) in Saveur Magazine I knew I had to try it. And it did not disappoint. 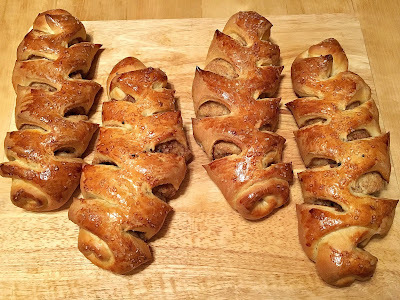 It is perfect for a light meal or snack and makes an impressive party treat. 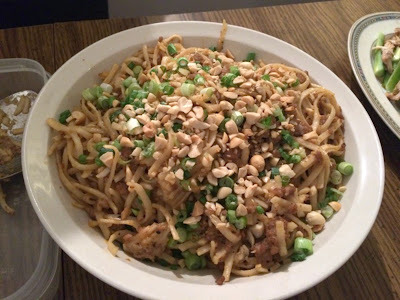 Both the dough and the meat sauce come together easily and can be made ahead and refrigerated for a day or two. It's a little bit of a production to roll out and top the dough but well worth it. And as good as the sauce is on the flatbread, it would be just as good on its own over eggplant, sweet potatoes, or other vegetables. It's a winner either way. Combine the starter, flour, sugar, salt and water in a large bowl and stir to form a dough. Transfer the dough to a lightly floured surface and knead until smooth, about 6 minutes. 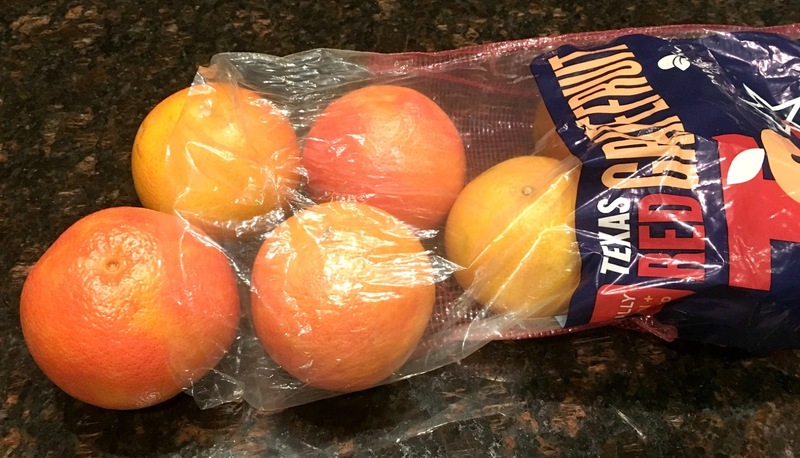 Place in a lightly oiled bowl and cover with plastic wrap. Let rest until doubled in size, about 1 hour. Punch down the dough and divide it into 4 pieces. Roll each piece into a ball and place them onto a floured baking sheet. Cover with a damp towel and let rise until doubled, about 45 minutes. 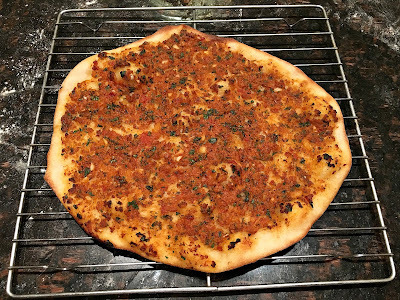 While the dough is resting combine the oil, tomato paste, parsley, cayenne, cumin, paprika, and cinnamon in a medium bowl and stir vigorously with a fork. Add the lamb, garlic, tomatoes, onions, chilies and salt and mix well. Set aside. Put a pizza stone or an inverted rimmed baking sheet in the bottom third of oven and heat oven to 475°. Roll each ball of dough into a 10-inch disk. Brush off excess flour and transfer each one to a piece of parchment paper. Spoon three to four tablespoons of the topping onto the dough and using your fingers or an offset spatula, spread it evenly to the edges. Season with salt. Hold the parchment paper by its edges and transfer it to the baking stone or upside down baking sheet. Bake until the dough is golden brown and the topping is cooked, 6 to 8 minutes. 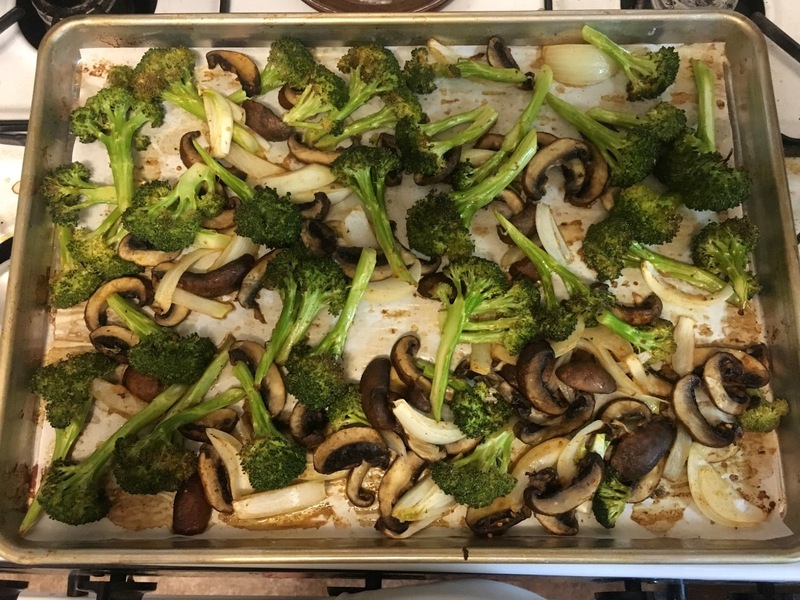 Broccoli and mushrooms are something I try to eat every day, as they are both quite good for me. When the weather is warmer I will usually just cook up the mushrooms using this cool method I discovered a couple of year ago and throw them in a container with frozen broccoli florets and take them to work with me. 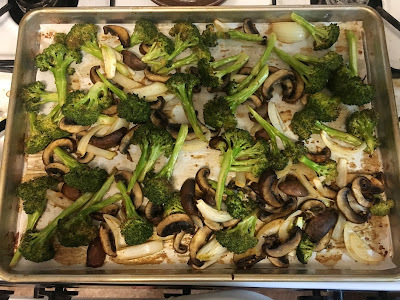 By the time lunch rolls around the broccoli is defrosted and the mushrooms have enough flavor from the sherry and olive oil to make a delicious side. But when the weather gets colder I like to roast them together with some onion and herbs for a quick side. It's super easy and full of flavor and goes with just about everything to make a satisfying dinner. I make it at least twice a month during the winter. Once you try it I am sure you will, too. Line a half-sheet baking pan with parchment paper. Preheat the oven to 425° F.
Combine all of the ingredients in a large bowl and stir to coat well with the olive oil. Spread the mixture evenly into as much of a single layer as you can. Bake for 10 minutes and then turn the pan in the oven. Bake for another 10 to 20 minutes, until the broccoli and onions have some char on them. Serve immeditely. As often as I make bread, there are still times when I do not have any in the house. Which can be a problem on a lazy Sunday morning when I want to make a nice breakfast of fried eggs and toast. This actually happened to me the first time when I was visiting my brother and his family in Austin when they had given up flour and most grains. The only grains they had in the house were instant oatmeal flakes with a questionable use by date and cornmeal. And I wanted eggs. But I needed something to go with them, but what? And I started thinking about the cornmeal and how it can be used to make polenta, and how similar it is to grits, and I realized I could probably make a single serving to go with the eggs. Which is what I proceeded to do. I brought three-fourths of a cup of water to a boil in a small saucepan and then added one-fourth of a cup of cornmeal and a little bit of salt. I turned down the heat as low as it would go and simmered the mixture for about 20 minutes and then poured it out onto a plate to let it cool. I then cooked up the eggs and plated them on top of the polenta, which had cooled enough to set. 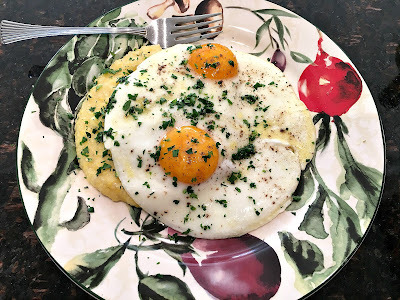 And while not the same as toast (and let's be honest, nothing beats toast with eggs), it was quite tasty and satisfied my need for some kind of carbohydrate to go with the eggs. And it was filling, too. And it impressed the hell out of my brother and sister-in-law. Slowly stir in 1/4 cup of cornmeal (I prefer coarsely ground but any kind will do). Turn the heat down as low as it will go and cook, stirring frequently, for about 20 minutes, adding more hot water as necessary. 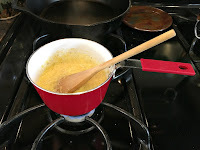 After the 20 minutes, when the mixture is thick and the cornmeal has softened, add about a tablespoon of olive oil or butter and 1/4 cup grated Parmesan cheese (optional but really adds to the flavor!). Stir well and remove from the heat. Pour the polenta out onto a plate and let it stand for about ten minutes to set. 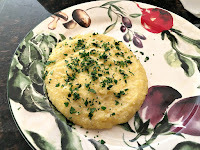 If you are lucky enough to have some fresh parsley on hand from an earlier dish (as I was), sprinkle chopped parsley over the polenta. Top with eggs, shrimp, sausage, or whatever you have on hand and serve immediately.